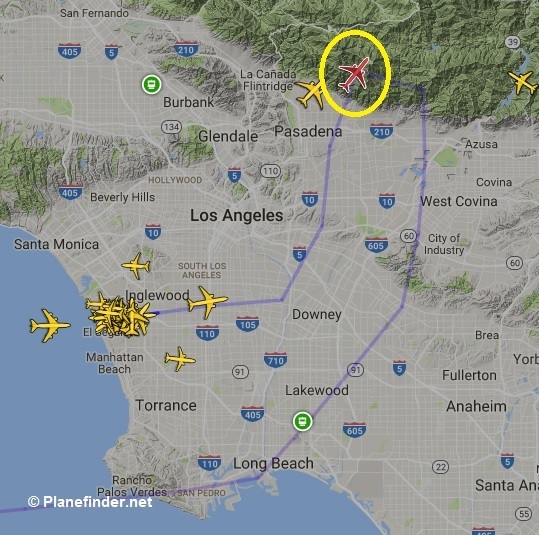 After departure from LAX International Airport, the Boeing 777 turned onto a wrong heading bringing it close to rising terrain and to another aircraft before the situation could be resolved. 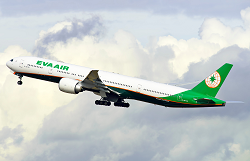 EVA Air trans-pacific flight BR15 from Los Angeles-LAX Intl Airport (LAX, KLAX) to Taipei-Taoyuan Intl Airport, Taiwan (TPE, RCTP) with 353 people on board, took off runway 07R at 01:19L. In the initial climb-out, after establishing radio contact with SoCal departure (located in San Diego) the flight was cleared for a easterly heading with the intention to turn the flight further south to follow its prescribed departure route before the flight was to begin its oceanic flight to the northwest. 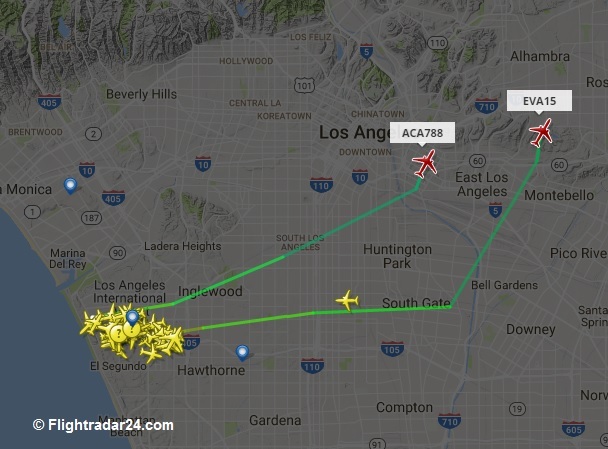 For yet unclear reasons, BR15 turned to the left to a northerly heading coming into conflict with Air Canada 788 (AC 788, a Boeing 787-800 , C-GHPX, route: LAX – Toronto) flying from LAX on a northwest bound departure route a few miles behind flight BR 15. 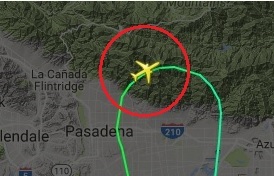 Apparently there was confusion in the EVA Air cockpit as to weather turning left or heading southbound which would have required a turn to the right. Meanwhile its flightpath came into conflict with another jet, an Air Canada flight. The canadian jet was instructed to accelerate its climb while BR 15 was ordered to stop climbing immediately. 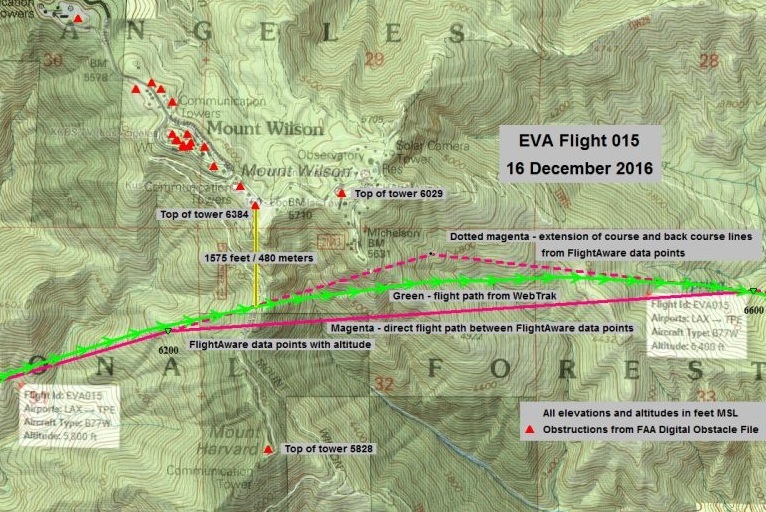 At this time, EVA 15 was flying at about 4,800 feet at high speed (330 kts) near Pasadena / Altadena while heading northbound towards San Gabriel Mountains with peaks up to 6,600 feet. At this point BR 15 initiated its turn to the right and gained altitude. 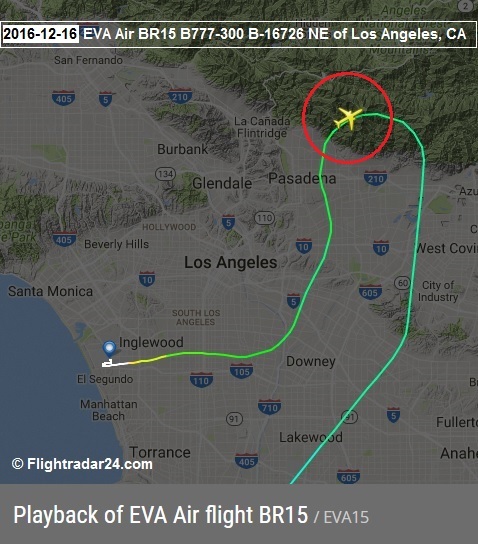 In the developing situation, SoCal Air Traffic Controller urged EVA 15 several times turn southbound again and to climb to 7,000 feet. 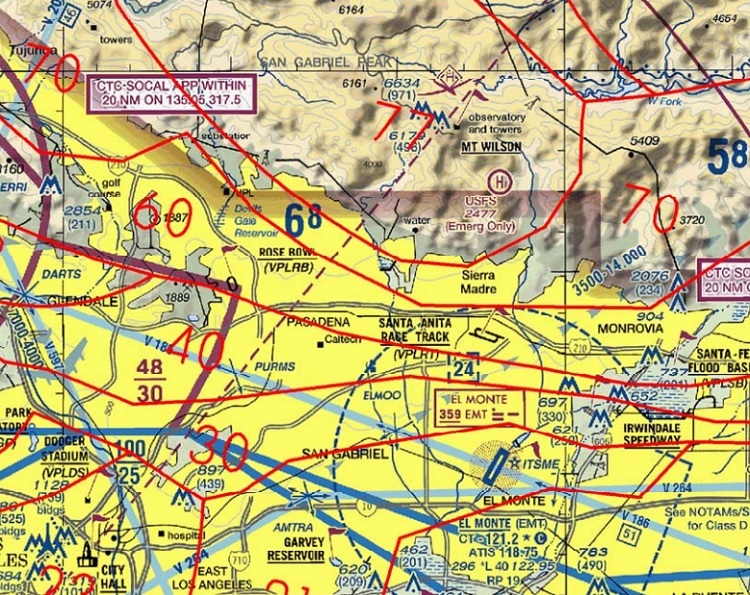 According to ADSB tracking data, flight BR15 – while turning – barely cleared the mountaintops and was flying just south of Mt. 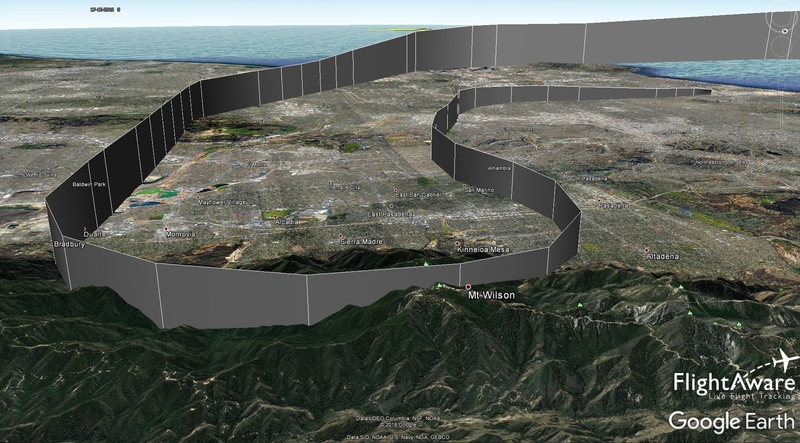 Wilson Observatory (5,715 ft) at an altitude of about 6,250 ft. before the flight gets back into safe airspace. Next to the observatory, there are a number of high rising antennas installed. Adding the physical top of Mt. Wilson to a level of 6,634 feet, almost the same height BR15 was flying by. The Boeing 777-300 then picked up its assigned route and landed safely at Taipei 14 h 17 min later. This serious incident is under formal investigation by the FAA. 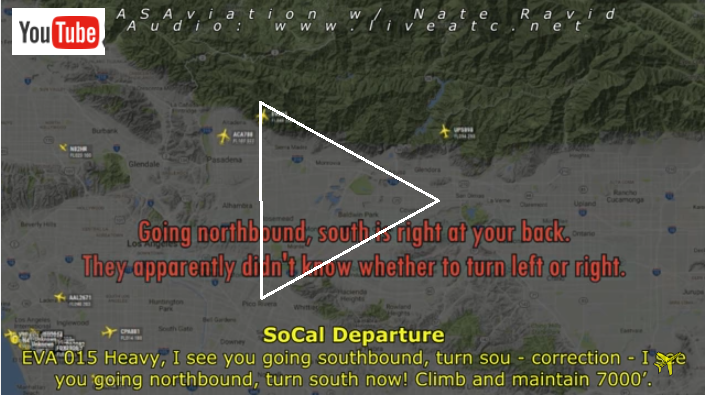 In May 2017 the NTSB issued an Incident Report, classifying the occurrence as an incident. Playback of EVA Air flight BR15 at Planefinder.net. 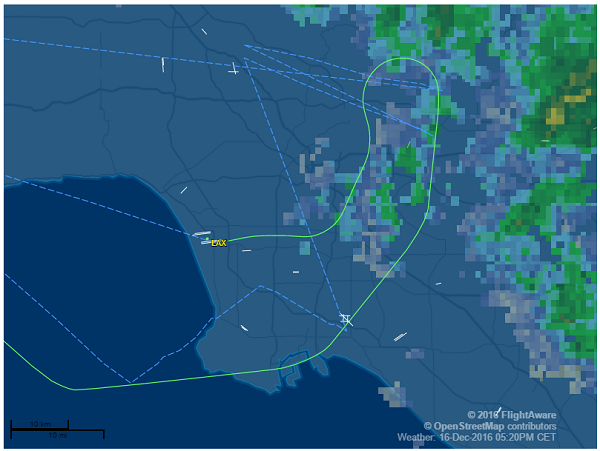 At 2:19 a.m. on Friday, December 16, EVA Air flight BR015 followed Air Traffic Control’s instruction to take off from the right side of Los Angeles International Airport’s No. 7 runway. The pilot also complied with the controller’s direction and speed instructions. Our flight was never too close to other aircraft or to the mountains. EVA is working in full cooperation with the US Federal Aviation Administration (FAA) and related authorities in the investigation of this situation.